Registration for the 2016 Margin Protection Program is currently underway, and the final day for sign up is September 30th. Now is the time to evaluate all of the tools in your risk management toolbox. This will help ensure your operation is adequately protected against declining milk prices and margins. 1. Educate yourself. If you didn’t enroll for 2015 but are looking to enroll for 2016, or if you are in need of additional information, check with your local FSA office regarding available upcoming educational meetings. You can also experiment with the updated MPP Decision Tool on the Dairy Markets and Policy website, dairymarkets.org. The decision tools allow you to stress test your dairy operation to see how varying milk and feed prices affect your operation’s financial health. 2. Leverage your network. Meet with your trusted advisors to review your operation’s current financial position, and assess how the MPP can fit into your risk management strategy. Remember, the Margin Protection Program replaced MILC and there are currently no other government safety nets to protect against significant decreases in dairy margins. As a reminder, you are no longer able to have a combination of LGM and MPP for 2016 and enrollment in LGM for any month of 2016 makes you ineligible for the MPP. 3. Evaluate your needs. If you were enrolled in MPP for 2015 and do not elect a coverage level by September 30th, your coverage will automatically default to the catastrophic $4 level. Don’t forget, you can change your coverage level right up until the registration period ends. You can go into FSA and sign up at the $4 level, evaluate projected margin positions based on markets in late September, and then confirm if you are still comfortable with your original selection or need to make a change. 4. Plan for potential expenses. Similar to last year, there is a $100 administration fee due at sign up for all coverage levels. At least 25% of your premium is due by February 1st and the remainder is due by June 1st. Talk with your lender about financing options to cover these potentially large cash outlays. It is imperative to take some time and assess what risk management strategy is appropriate for your farm, based on your financial position and your appetite for risk. Remember leaving yourself open to the market is not a strategy, it is simply risking unknown margins on 100% of your production. Steve is a Business Consultant working with the AgStar dairy consulting team since 2012. He grew up on a family farm in north central Wisconsin and received his Bachelor’s degree in Animal Science from the University of Wisconsin – Madison and his Master’s degree in Animal Science from North Dakota State University. When to start harvesting – Harvesting at the correct moisture (dry matter) promotes favorable fermentation in the silage crop and decreases storage losses. Thus, the moisture content of the chopped plant should be the determining factor for when to harvest. For bunkers, silage should contain between 30 to 35% dry matter (65 to 70% moisture). Upright silos and bags can be a little drier at 35 to 40% dry matter (60 to 65% moisture). Length of chop: Unprocessed corn silage should be chopped at 3/8 to ½ inch length and processed corn silage (with kernel processor) at ¾ inch. Adjusting silage choppers with on-line kernel processors: To optimize starch digestion and provide adequate effective fiber, the recommendation is to cut to ¾ inch theoretical length with an initial roller clearance of 0.12 inches. If kernel breakage is not adequate, the roller clearance should be decreased. With this year’s weather, kernel size may be smaller thus the need to decrease the roller clearance compared to previous years. To test whether adequate kernel damage is occurring, collect a silage sample from several loads in a 32 ounce cup. Pick out and count the number of whole and half kernels. If the number of whole or half kernels exceeds 2 or 3, improve kernel damage by adjusting the roller clearance. Essentially, the goal is to have between 55 to 64 percent of the kernels damaged. Weight of tractor needed for packing bunkers and piles: To achieve adequate silage density, the packing vehicle’s weight and thickness of a layer of silage being packed must be taken into consideration. Thinner layers pack quicker. The packing vehicle weight determines filling rate (tons/hr) or to look at this differently, filling rate determines the weight needed for the packing vehicle. Filling rate or weight of tractors used to pack silage can be calculated using these equations. Remember: Fill all silos quickly, cover piles, uprights and bunkers with plastic, and for bunkers make sure tires touch to weight down the plastic. Nitrates in drought stressed corn: In drought areas of KY, test for nitrates before feeding. Nitrate levels are generally reduced by 50% in silage which has been fermented properly. The highest level of nitrates is found in the bottom part of the stem, so raising the height of cut from the soil surface may reduce nitrate levels in the harvested crop. Come and learn about pasture management and how the University of Delaware’s Webb farm is trying to extend grazing season. We will discuss incorporating brassicas, fodder beets, and other short term, high DM yielding crops (NZ style) for smoothing out the bottoms in the grass growth curves. Experts will be on hand to answer specific questions. The meeting is free and open to anyone interested in attending. Please register by Friday, September 11! Scrapie. A word in the sheep and goat industry that is well known by many, but is truly understood by few. 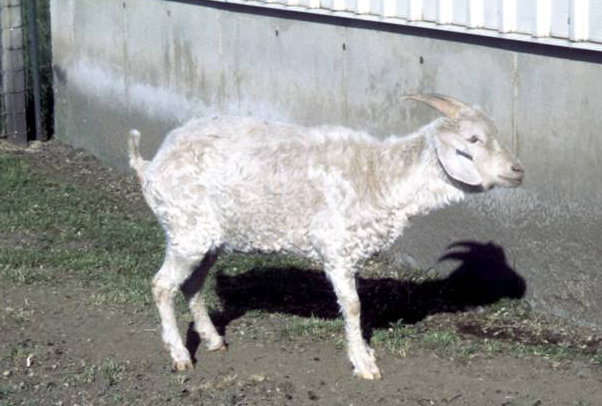 Scrapie is defined as a fatal, degenerative, neurological disease that affects a sheep or goat’s central nervous system. Scientifically, scrapie is classified as a transmissible spongiform encephalopathy or TSE, which is closely related to BSE or Mad Cow disease. The disease itself was first spotted in the United States in 1947 but has been recognized since 1732. Since then, it rapidly spread across the globe, causing massive damage to the sheep and goat industry as a whole. However, with increased awareness and improved management techniques over the years, countries began eradicating the disease from their flocks. Both New Zealand and Australia have successfully eradicated scrapie from their flocks, with the United States attempting to become the third scrapie free country. With scrapie costing the United States sheep industry ten to twenty million dollars annually, it is critical for each breeder to do his or her part in helping the country become scrapie free. In order to eradicate this disease, it is important to understand and become educated on the causes, signs, and prevention of scrapie. Although still being further investigated by scientist and researchers, an agent that is smaller than a virus and linked to the prion protein is the cause of scrapie. The scrapie agent causes the normal cellular prion protein to become abnormal, causing the cell to grow and replicates at an alarming rate. Scrapie is also highly contagious and can travel from sheep to sheep fairly quickly. 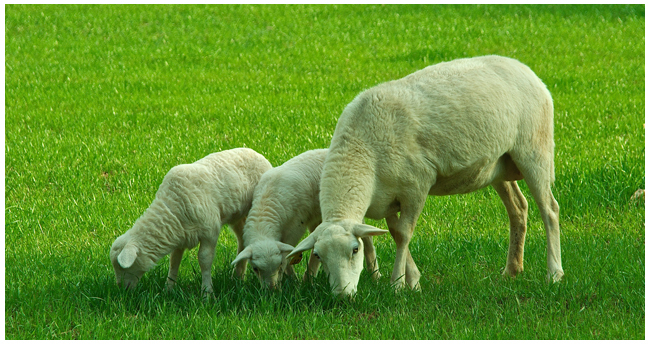 Scrapie can be transmitted via bodily fluids of the infected animals, most commonly from an infected ewe or doe to her offspring through the afterbirth or milk. An animal’s genetic make-up also plays an important role in the susceptibility to contracting scrapie with certain DNA characteristics and breeds, such as Suffolk and Hampshire, having higher risks for contracting the disease. In order to proper defend a flock from scrapie, it is important to be able to recognize an infected animal as soon as possible. Initially, an animal infected with scrapie may appear healthy since scrapie does not begin to take its toll on the animal for two to five years. Scrapie causes several signs and symptoms that can vary animal to animal and can also vary in severity. An animal with scrapie may experience weight loss, behavior changes, tremors, sensitivity to sound or light, or itchiness. More obvious signs include: wool pulling, biting of limbs, hopping on rear legs, inability to stand, or even death. 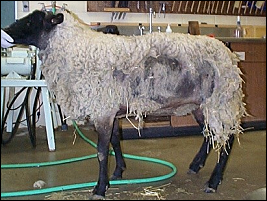 It is critical to be able to recognize these signs and symptoms since a scrapie positive sheep should be immediately removed from the flock to prevent further contamination. Currently there is no treatment, for the disease is ultimately fatal to any animal that is infected. However, scrapie can be prevented if the proper measures are taken to ensure the safety of the flock. Scrapie is known to have a heat resistant quality and be resistant to standard cleaning practices, making it somewhat difficult to eradicate once present on farm. Regular cleaning of the ground and fences with strong bleach or lye has been proven to kill scrapie. It is also important to ensure that the birthing area is clean, has fresh bedding, and is free of afterbirth. By eliminating places for the scrapie disease organism to lie dormant, the risk of scrapie becomes substantially lower. Another prevention method is to verify that those selling sheep or goats are part of the scrapie certification program and to ensure any sheep bought have proper scrapie tag identification. Throughout the country, each state has taken different precautions to make sure that any scrapie outbreaks can be quickly traced back to the flock of origin and stopped as soon as possible. In Delaware specifically, all sheep and goats require an official ear tag prior to moving off the premises of origin in order to trace the animal should it contract scrapie. 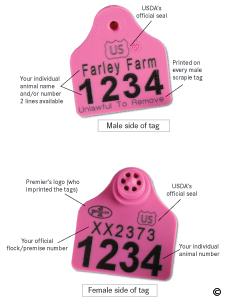 Scrapie tags are thin, usually white, ear tags that include an animal number along with a unique scrapie number specific to a producer’s farm and the US shield. These tags can be easily acquired at any time by calling 1-866-USDA-TAG at no cost to the animal owner and the tags never expire. The National Scrapie Eradication Program will also send those that order scrapie tags a free applicator, making the process easier for producers and eliminating excuses for not following the program. Example of an official scrapie ID tag. Courtesy of Premier. No endorsement intended. Many times sheep and goats are often bought and sold to various producers around the country for breeding purposes with can cause some confusion on proper scrapie tag management. If buying sheep or goats with a scrapie tags already in place, then the buyer should leave the original tag in and not replace it with their own. All sheep must have a scrapie tags in place before being sold initially, with the responsibility of this falling on the breeders to perform this action. Finally, scrapie tags should never be shared since they include a number that is specific to one individual producer or farm and would cause confusion should an outbreak occur. Guest Blog by Hunter Murray, Extension Scholar 2015. Hunter is a lifelong sheep breeder and can be reached at hmurray@udel.edu. Scrapie. Colorado State University Extension. Web. 11 Aug. 2015. The new Veterinary Feed Directive (VFD) regulation from the Food and Drug Administration (FDA) marks a major change for the livestock industry. Veterinarians will soon have increased responsibility for prescribing antimicrobials in feed and water — and the roles for producers, nutritionists and feed suppliers also will change. Led by several industry experts and brought to you by Zoetis, this interactive webinar will examine the VFD regulation, including roles and responsibilities, timing and requirements. Do you have questions about the VFD? You’ll have the opportunity to ask the experts after the presentation. You may have noticed that the price of eggs have increased in the past couple of weeks. The main reason is due to a shortage of eggs coming from major egg producer states. The United States is home to roughly 280 million laying hens that produce around 75 billion eggs a year. Iowa is the largest egg producing state with over 58 million hens in production. According to the American Egg Board the 2014 per capita consumption of eggs in the United States has increased to 263 eggs. Of that 60 percent of the eggs produced are used by consumers, 9 percent used in the food service industry leaving 31 percent of the eggs being used in egg products like cake mixes and mayonnaise. The main reason for the increase in egg prices is due to a decline in laying hens that have contracted Avian Influenza. Avian influenza (AI) is the bird flu. Just like humans there is a flu that affects birds. AI is a virus that naturally occurs in wild birds such as geese, ducks, shorebirds and can spread to domestic poultry like chickens and turkeys. Unlike humans wild birds cannot go to the doctor if they have the flu and from what I have been reading the last human flu shot was only 19 percent effective. AI is primarily spread through direct contact between healthy birds and infected birds. The virus is excreted through the feces of infected birds and is the most common cause of transmission. The issue is that our major egg producing states are on flyways for ducks and geese that migrate during certain times of the year which puts our hens in jeopardy. The signs of illness of birds infected with AI typically have decreased food consumption, coughing and sneezing along with decreased egg production. However, there is no need to panic if you have a back yard flock. The United States Department of Agriculture (USDA) has developed recommendations that may prevent a poultry disease outbreak. 1. Restrict access to your property and your birds. 2. Keep your clothes, shoes, equipment and hands clean. 3. If you have been near other birds or bird owners, clean and disinfect poultry cages and equipment before going home and follow number 2. 4. Don’t borrow tools and poultry supplies from other bird owners. 5. Know the warning signs such as sneezing, coughing, nasal discharge, lack of energy, poor appetite and sudden increase in mortality. 6. Sick or dead domestic birds, including backyard flocks and commercial poultry, should be reported to the Delaware Department of Agriculture’s Poultry and Animal Health Section, (302) 698-4500 or (800) 282-8685. 7. To report groups of dead or sick waterfowl, shorebirds or gulls, contact the Department of Natural Resources and Environmental Control’s Wildlife Section-Wildlife Disease Program at (302) 735-3600. In summary proper biosecurity measures can prevent disease outbreaks. Isolating your birds from wild birds is key in the fight against AI. If you have any questions stop by the New Castle County Cooperative Extension Office located at 461 Wyoming Road in Newark, Delaware, or phone 302-831-2506 for more information. For comments or questions email me at severson@udel.edu or follow me on twitter @DanSeversonUD.